BH Redesign goes live January 1st. This is Ohio’s major behavioral health coding change in order to be nationally compliant with current guidelines. 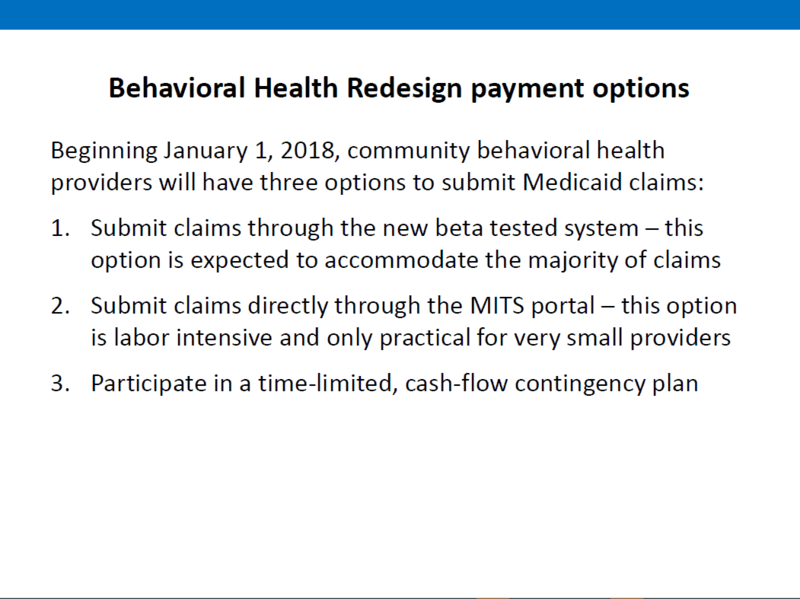 In preparation for January 1st, the Joint Medicaid Oversight Committee (JMOC) approved the Ohio Behavioral Health Redesign coding and service offering to go live effective January 1st, 2018 for Medicaid and MyCare Ohio plans. This means that ALL Medicaid providers that offer behavioral health services in Ohio must bill any service provided AFTER December 31st, 2017 using the new code set and rules. For complete information on the Ohio BH Redesign, go to their home page. With Ohio BH Redesign going live January 1st, 2018, providers need to ask 3 questions. Does your system function accurately with the Redesign coding changes? If not, what are your plans? 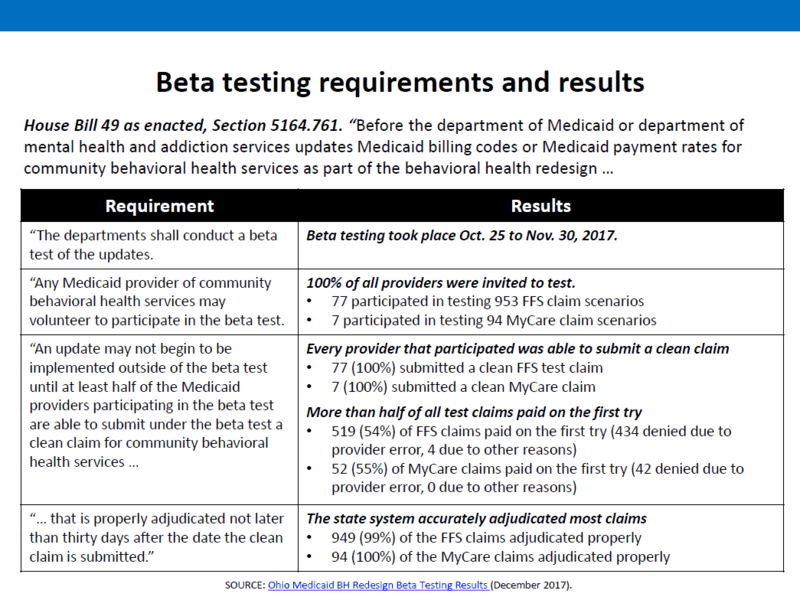 Below are the results from ODM including their compliance to House Bill 49 and the requirements that 50% of beta testers be able to bill one clean claim. Keep in mind that on 09/13/2017 at the EDI work group, Medicaid stated 243 providers had signed up for beta testing. Of that 243, only 77 providers submitted actual beta tests. In reality, what that means is only 32% of the providers signed up and committed to beta testing, actually participated in beta testing. Why? Director Sears stated most beta testers NOT submitting files that were contacted stated their software had already been tested and they did not feel a need to participate. A small percentage stated they weren’t ready. ODM presented 3 options for agency’s in Ohio. On a side note, Director Sears stated she actually tested one of the options, which is to manually enter claims on the MITS portal, stating there is no change to the process. She entered 3. In reality, that is a correct statement, the data entry process has not changed. However, the data that needs to be entered has changed quite dramatically. In addition, Medicaid provided 3 links to informational pages related to direct entry of claims. See ODM’s presentation here and ODM’s official Beta testing results, based on 1 clean claim per Beta tester here. 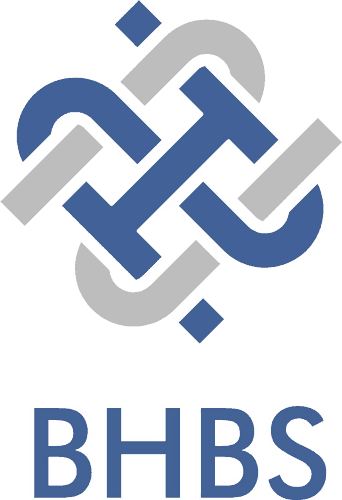 As a behavioral health billing company, BHBS has assisted many client’s with preparing their system and testing for the redesign. Below is a summary of the Beta and Fee for Service testing completed by BHBS, from 10/25/2017 – 12/15/2017. We submitted our last test file at 5:58 pm on the 15th. Now with that stated, I believe all of our Beta testers were able to submit one clean claim. However, from the results I received, will those agency’s be able to survive on an average 26% percent reimbursement? My hope is that Director Sears is correct in her statement that MOST agency’s are ready and fall under option #1. Based on our testing and many contacts with agency’s across Ohio, I fear that number is significantly lower. Our estimation is less than 50% of Ohio providers are prepared to submit all claims through their EHR. Below are options for billing if your software is not redesign ready. Option #1 – Bill claims electronically through your current EHR/Practice Management system. Option #2 – Bill services direct through the Medicaid portal. I’ve done it. It’s painful and trying to translate your current service’s and any new service offerings into what is required under the redesign is to say the least, extremely challenging. Option # 3 – ODM is offering providers not ready to sign up and receive a guaranteed payment of 27% of last year’s estimated revenue IF your system is not ready to bill AND you are not prepared or able to bill all claims through the MITS portal. Please click here for more details on that option. In order to assist agency’s maintain viability during this turbulent time, Behavioral Health Billing Solutions is offering a new line of service that includes complete data entry of your services, post January 1st. This service will include complete data entry with the Medicaid claim info and payment status reported back in a secure manner. The fact is, we know BH Redesign rules and coding, inside and out. In addition, as part of this new service, we will include running an eligibility check on your entire client base, including Medicaid, Self-pay and board client’s through our Power Generator from EMS Healthcare Informatics and provide you with a current list of your client’s Medicaid eligibility including their Managed Care Agency, once per month to ensure all client’s are Medicaid eligible. We are prepared to state that if the service is billable, all claims will be paid at 100%. Any incorrect services, (unable to be billed with submitted information), will be reported back to the agency to correct and resubmit for data entry. There is limited availability so for more information on this service line, please call BHBS today at 614-395-0136 or email Teresaheim@bhbillingsolutions.com.